New to Devshed and this is my first post so I'll get straight to it. I have created a mini MVC framework using .htaccess to route the urls which worked great on my Mamp Apache server. Can anyone help me wrap my head around this nginx stuff and get it woking with MAMP? I'v done research into how to write rewrite rules for nginx and the benefits off nginx handling large traffic which I will need very soon connections, but I can't seem to get the 404's to stop. Thanks in advance guys. nginx doesn't do .htaccess files. You have to write configuration specifically for it that does the URL rewriting you need. There's no way around that. Thanks for responding I assume your talking about nginx.conf right? The problem is I can't seem to find out where to put the file, at least not relative to MAMP so I can do some testing. I cant really find any good tutorials for writing nginx with MAMP either. Do you know any? 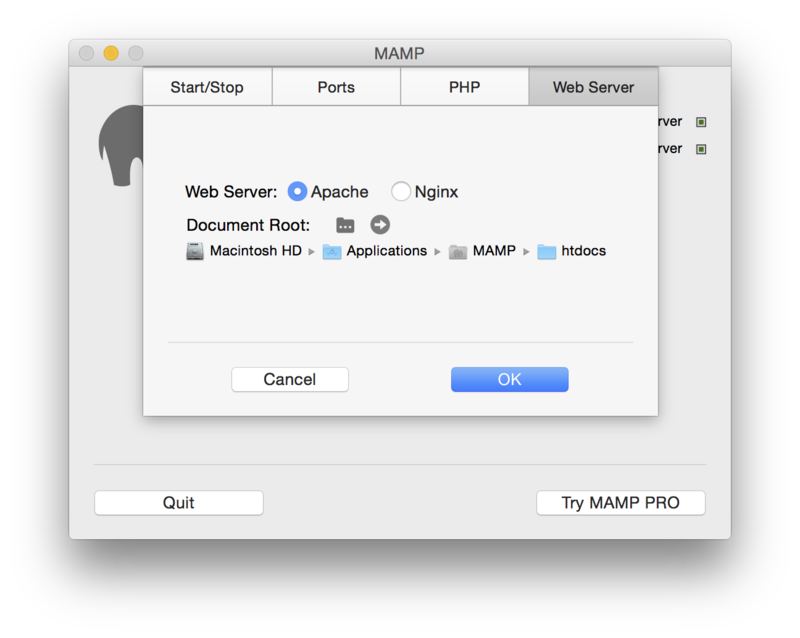 "writing nginx with MAMP" does not make sense. Apache and nginx are both web servers. You cannot use both. It's okay if you use MAMP for development and then nginx for your live site, but your code has to support both: put your URL rewriting in .htaccess for MAMP, then set up the equivalent URL rewriting configuration for nginx. You should also make sure nginx responds with a 404 if someone tries to access the .htaccess file (which is something Apache does for you automatically). In other words, stop editing your code and .htaccess files and start editing your nginx configuration to match it. Sorry I wasn't very clear about my MAMP question. There is an option to set MAMP to nginx. Do u know where I should create the configuration file? But... MAMP using nginx would be MNMP! I don't know. I suspect MAMP doesn't support it. See, nginx is not like Apache where you load a bunch of modules and stuff: you define a configuration and then build nginx. All your stuff goes into the web server itself directly without needing .htaccess files or mod_anything - and that's actually nginx's biggest selling point. Does this site have like a repping system so i can +rep you for your help? Meh, you can (maybe, I'm not sure with new user accounts) but it's not really that important. According to the "revision history" on the MAMP website, the MAMP package does include the nginx web server. It runs on port 7888 by default, as opposed to the Apache Web Server , which runs on port 8888 by default. I downloaded and extracted the MAC version and found a conf directory that contains the nginx .conf files. Use Finder and look in Applications/MAMP for a conf sub-folder, that is where you would create/edit the nginx conf files to setup the rewrite rules. Last edited by DonR; July 10th, 2016 at 08:17 PM.